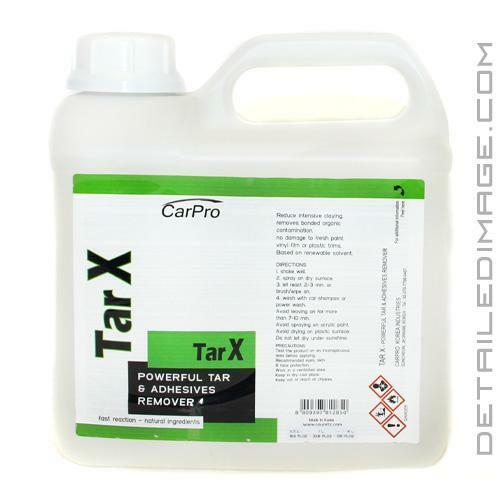 The CarPro Tar X Tar and Adhesive Remover is far more than an ordinary degreaser so don't underestimate just how amazing this product is. It's a very strong yet relatively gentle product that can quickly remove not only tar but also asphalt, bug smear, tire marks, stubborn adhesives, road grime, brake dust and so much more. When you spray it on tar you can literally see the tar start to dissolve within seconds which saves you from scrubbing with too much arm pressure or using aggressive clay bar treatments. To explain why this formula is so advanced we'll start with how it's made. Tar X utilizes all of it's cleaning power from the solvents extracted from orange peels, which contain no chlorinated solvents or harsh chemicals so it's non corrosive. The number one ingredient in many cleaning product is actually water or fillers but Tar X boasts 60% active ingredients and a thicker viscosity that clings to the paint and won't run as fast. Another original characteristic is the "glow color tracer" which you have to almost see to fully believe. When you spray it on the paint it leaves a neon green glow on the paint so you can see exactly where you have sprayed. In fact, this neon glow will quite literally glow in the dark if you use it at night, but it rinses clean with just a quick spray from the hose. To apply it just spray it on the paint and wait about 1 - 2 minutes before rinsing it off or for stubborn build ups agitate with a soft sponge and rinse clean afterward. During use avoid direct sun and don't leave it on the exterior for more than 7 - 10 minutes, especially plastic parts. The only other precautions for the vehicle is to not use it on acrylic paints and work in a ventilated area. It's safe on fresh paint, vinyl films, chrome trim, vinyl/plastic trim, etc. again just don't leave it on excessively or dry up. After you apply it you'll be amazed at how much this formula can remove from the exterior because the tar literally melts away where as many other formulas just soften it up at best. Please remember despite the strong cleaning power you are using a citrus based cleaning product that is non corrosive. Let react 2-3 min. or brush/wipe on surface. Avoid leaving on for more then 7 ~ 10 min. Avoid spraying on acrylic paint. I had trouble getting some sap off my car and this did the trick. I work near an Asphalt Plant, and the stuff that gets on your paint when the when the wind blows just right is depressing. Only thing that really seemed to work was to claybar the paint. This product takes the stress of marring from using a claybar away. Melts it right off. Love CarPro products. This really works well for removing tree sap and road tar! Just be carful to not get on plastics and trim.